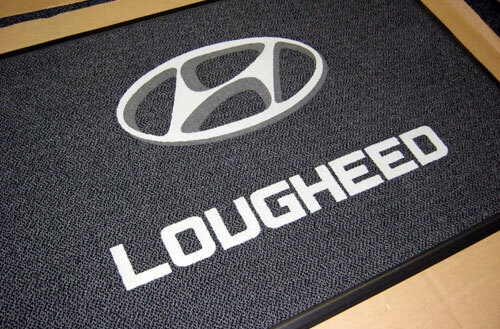 Inlaid Logo Mats - Commercial Flooring & Mats Vancouver | Source Floor & Specialties Inc.
Quality entrance matting saves money. Matting keeps your floors clean, dry, and safe. Our logo mats are inlaid, not printed! Not sure of the difference between inlaid and printed logo mats? Click here to find out! Check out all our Standard Logo Colours for inlaid Grizzly FX logo mats here! 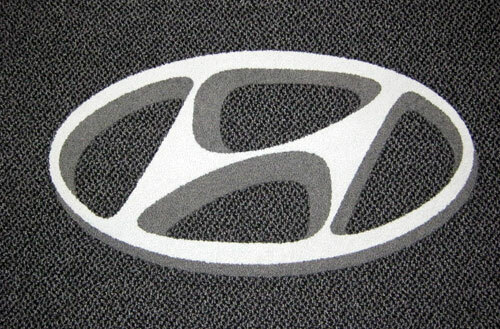 Because all our commercial logo mats are inlaid and not printed, bigger is better when it comes to complex logos. The smallest element in your logo needs to be at least as big as a dime – the smaller the mat, the simpler the logo has to be. All our mats are custom-made right here in Port Coquitlam BC, so we can make it fit your commercial building’s lobby, atrium, vestibule, or entrance – you’re not stuck with “standard sizes”! The size of the mat you need (length by width in feet and inches, please!) We can sometimes go as small as 2×3 for very simple logos or single words, but at least 6 feet wide is a good place to start. All our mats are custom-made to order – nothing comes “off the shelf”. The Carpet and Rug Institute suggests that mats be at least 6 to 15 feet. This allows for five to six steps on the mat, which can remove as much as 80 percent of the soil and moisture on shoe bottoms. Where you’re located (if you’d like us to ship it to you.) If you’re in Greater Vancouver, we’d be happy to come down and measure! We create logo mats with our Grizzly FX and our Kermode matting. See some of our logo matting projects here! 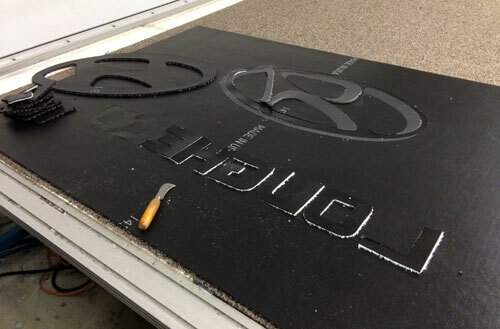 Step 1: Each element in your logo mat is computer-cut out of separate pieces of matting material. Step 2: We prepare the field material to have the logo pieces inlaid. Individual pieces of material mean that your logo will never smudge, fade, or wear off with traffic. Step 3: The logo elements are inlaid by hand into the field one piece at a time and chemically welded together for outstanding strength and durability. Step 4: The finished product! Select a mat as your base. Our staff would be happy to help you choose the right matting product to meet your facility’s specific needs. We recommend our Grizzly FX (for indoors) and Kermode (for covered outdoors) applications. Send us your specifications and vector artwork. Let us know the size, shape, and logo placement for your new mat. Not sure what a vector graphic is? This YouTube video explains it all! Receive the art proof and quote. We’ll create an art proof and quotation for your new mat and submit it to you for your approval. 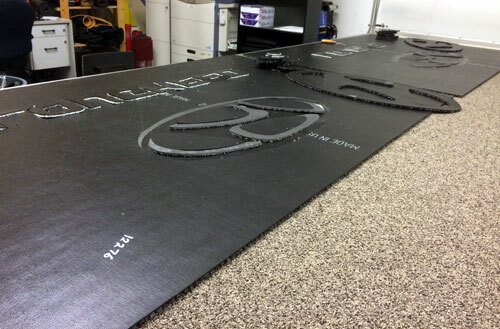 We can usually finish and ship most custom logo mats within 2 to 3 weeks. 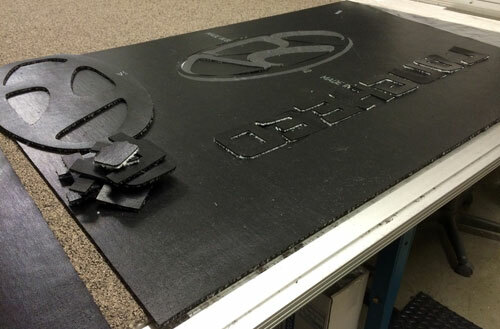 Recycled tire rubber for heavy duty commercial traffic. Help in choosing the right mat.